Start your site's traffic from scratch and get traffic more than your server can handle! 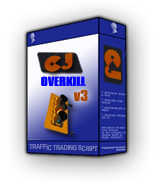 It's the world's most advanced and secure traffic trading script.... And its 100% FREE!!! For updates download the current package and read the UPGRADE.txt file into it .